Are all your Windows folders yellow and difficult to distinguish from each other? Why not mark folders with special icons based on what you’re storing in them? This way, you'll be able to find the right folder at a glance. Hundreds of people have found this approach useful and are using the original Everyday set of folder icons for years. But they are drawn in Vista style which might look good in Windows Vista, 7 and 8, but they look strange in Windows 10. That’s why we've decided to redesign them and release modern Windows 10-style icons*. This is how Everyday10 Folder Icons was born. * - Although these icons were designed in Windows 10 style, they can be used on Windows XP, 2003, Vista, 7, 8, 8.1 or Windows 10. After you mark your Windows folders with this set, every folder will have a noticeable icon on it that will help you find it at a glance. For example, you can store your audiobooks in the folder with a book and headphones on it. The files relating to your kids could be in the folder with a pink teddy bear, and your financial reports –could be in the folder with an image of money. Unlike icons downloaded from the Internet, these icons were created in one style, so they will look clean and neat on your computer. You can use these icons alone and mark your folders with them as you otherwise would in Windows. However, every time you need to mark a folder will mean lots of clicks. So we recommend you use the set together with the simple and safe Folder Marker Pro. With its help, you will have an opportunity to mark any folder by right-clicking the folder and selecting the desired icon from the Mark Folder menu that will appear there. 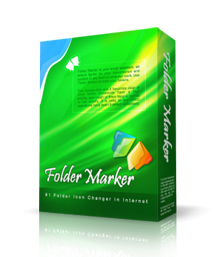 Moreover, Folder Marker Pro will give you 62 additional folder icons, the ability to mark your office documents, make a backup copy of the marking and transfer it to another computer or CD. Learn more about all the Pro features here.